Plan vacation or business trip with eTravel.com and take advantage of cheap rates on flights booking, airline tickets, and lowest airfares for Orlando. 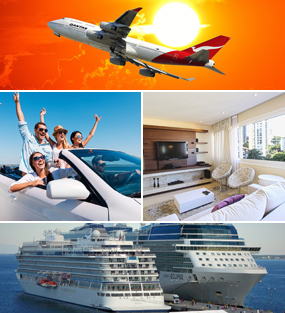 Search cheap flights to Orlando, find and book single or multi-city destination flights. On this page we give you information and glimpse of visiting places in Orlando, Florida, United States. The city of Orlando may be famous for its theme parks, but there is a lot to uncover here in this city of dreams. The mesmerizing roller-coasters, waterslides and haunted houses may draw you in, however the luxury resorts, superb shopping centers and adventure thrills will make you never want to leave. The people of Orlando love to celebrate art and take great pride in their culture. It’s a great place to travel to with family and friends because when you come to Orlando you'll be living the life and there’s nothing quite like it. What is The Best Time to Visit Orlando? Orlando is absolutely perfect during the period from January to April. The weather is pleasant, the prices are low and the crowds are way less compared to the summer season. The absolute worst time to come to Orlando is during summer break when everyone is headed here, the prices on hotels, restaurants, boutiques and flights all soar to an all-time high and the climate is hot and sticky. If your holiday plans come together earlier, fall also is a great time to go to Orlando and experience the magic. What are the Top Attractions for Tourists in Orlando? Discovery Cove - A theme park owned and operated by SeaWorld Parks & Entertainment, the Discovery Cove offers an opportunity to interact with many varieties of marine animals, including bottlenose dolphins where the visitors can “talk, touch, play and swim” with them. The guests can also interact with various species of exotic birds, tropical fishes, rays, and even land mammals. It contains a coral reef, where visitors can use snorkeling equipment to see and interact with hundreds of thousands of tropical fishes, and Sting Rays measuring up to 4 feet in width, in addition to underwater shark and tiger-fish tanks protected by special quality glass. A heated Tropical River circling the park also runs through it, allowing the visitors to pass by an assortment of beaches, waterfalls, and even a rainforest. Disney's Hollywood Studios - Originally known as the Disney-MGM Studios, they include four theme parks built over 135 acres (55 ha). The studios are dedicated to the show business, and are inspired by the heydays of Hollywood during the 1930s and 1940s. The studios are visited by approximately 9.7 million tourists every year making it one of the most visited amusement parks in the world. The park is symbolically represented by The Sorcerer's Hat, which is a stylized version of a magical hat appearing in the animated film “Fantasia”. Parades like the Pixar Block Party Bash and live street entertainment can be found along the park throughout the day. Echo Lake, a small oval-shaped lagoon, offers numerous attractions and amusement related activities. SeaWorld - SeaWorld is a marine-life based zoological park, owned by SeaWorld Parks & Entertainment. The killer whale mascot “Shamu” offers Shamu's Happy Harbor which is a children's area featuring many family related activities, including the Shamu Express which is a junior rollercoaster ride, in addition to a net climbing structure and a water-play area. The Key West is specially designed to imitate the appearance of the city’s Key West area, including its architecture and landscape. The animal exhibits of the park consist of , southern stingrays, cownose raysgreen, hawksbill sea turtle, sea turtles, loggerhead sea turtle, greater flamingos, Atlantic bottlenose dolphins, American alligators, West Indian manatees, and brown pelicans. The dolphin and stingray exhibits provide opportunities for the visitors to feed the animals. How to Save When on an Orlando Tour? Being a big tourist destination makes an Orlando vacation really expensive. But if you pick the slow season to fly out here, you are guaranteed to save some major cash. Choose an accommodation that fits your budget. If the hotels and resorts don’t match your range, scope for alternative lodging like bed and breakfasts, vacation homes, house exchanges or camping grounds. If you decide to go with a hotel, always eat out because hotel food and room service is very expensive and unnecessary expense. Another great money saver involves buying your theme park tickets online in advance. This way, you spend less and you don’t have to wait in line for tickets.